If you follow along with my Instagram then you’ve seen the sneak peeks I’ve been sharing on Lowes’ Instagram this past week of the progress on our backyard makeover! But in case you haven’t I’ll start from the beginning! Lou and I loved the backyard when we moved in, but the huge lawn (seen below) was expensive to maintain (SO MUCH WATER!!!) . We also barely ever utilized the space. So we decided, with the help of the fine folks at Lowes, to turn it into our TRUE dream backyard. And I have to say, it’s so far beyond what I could have imagined and we are just pinching ourselves fifty times a day that we get to live here!! Thank you so much Lowes for making this possible! 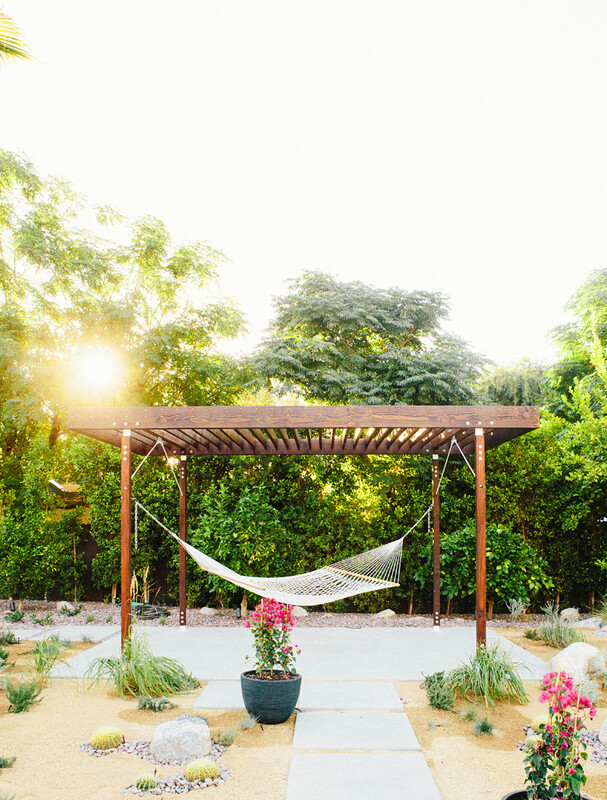 When we fantasized about possibilities for the yard the first thing that came to mind was a designated space to hang a hammock (the one shown above available here!). 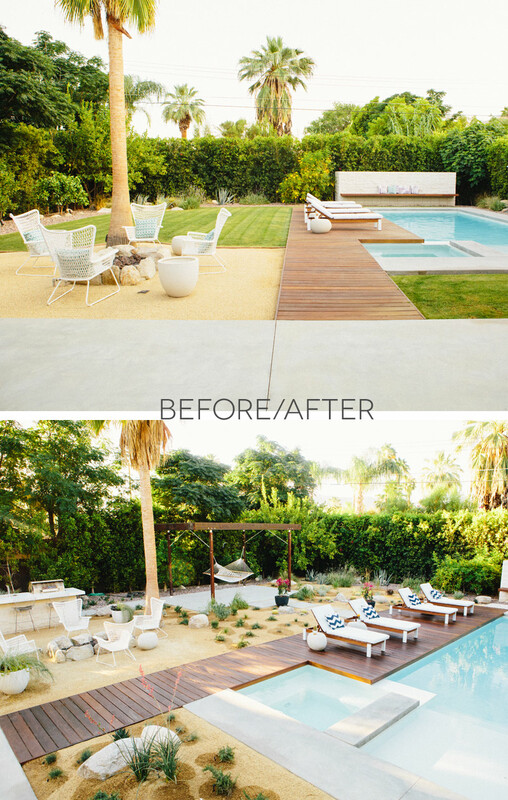 We knew that tearing out all of the grass and completing such a major overhaul on the yard would be well beyond our DIY skill level so we brought the incredible Falling Waters Landscape on board to help with the landscape design/install. We also enlisted our incredible friend Greg Coleman to design the structure. Knowing when you’re in over your head is so important with home projects! Both Falling Waters Landscape and Greg Coleman Designs are based in Southern CA and I couldn’t recommend either of them more, they made this project so much fun to work on and so far surpassed our expectations!!! 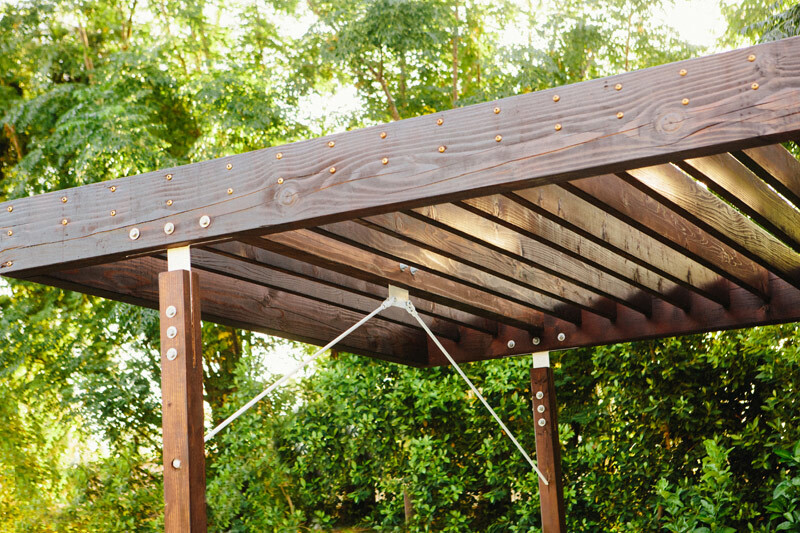 Greg came up with some brilliant ideas for the structure to keep it from overwhelming the yard. The floating ceiling, thin white support beams and floating posts all help keep it visually light and modern! We had those pieces fabricated, but all other parts of the structure were made from supplies we found at Lowes. I realized during this process that they have EVERYTHING YOU COULD EVER NEED. Seriously. One stop shop for home projects! I’m so in love with these pink flowers, and most especially because they attract hummingbirds like crazy! I am so looking forward to next winter/spring when the yard comes into bloom! Down the road we may take down the hammock and put a 12 person dining table under the structure. There are walkways leading to it from the pool and the grill, so it would be perfect for outdoor entertaining! But for now we’ll be taking hammock naps every chance we get!!! Our house feels like a resort! SERIOUSLY, PINCH ME!!!!!!!!!!!!!!!!!!!! TEN TIMES!!!!! Also, come over, let’s have a party!!!!! This is a seriously brilliant backyard. The use of succulents and midcentury furniture really brings it together! Seriously, though, this is gorgeous. A dream. 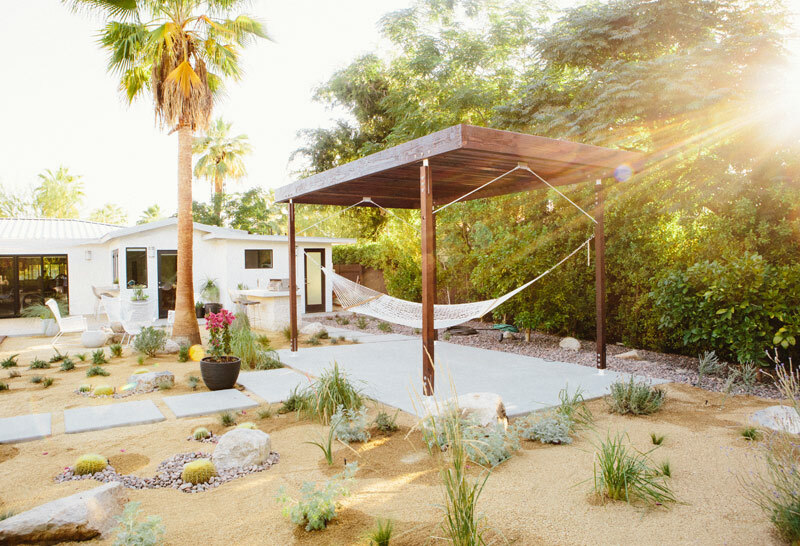 I love the desert landscaping and that hammock looks ideal for curling up with a book (or a long nap). Love love. P.S. Your Peanut Butter Cup Cheescake is sitting in my freezer waiting to be eaten tomorrow for my birthday celebration. It’s been torture waiting to devour it, but I’m pretty sure it will be well worth the wait! Wow! Can’t wait to see the BEFORE/AFTER/1-YEAR-LATER. So cool! But wait, I thought you guys were planning to move out of Palm Springs? Can you feel my jealousy? For real – it’s palpable. What a DREAM backyard!! You guys did an absolutely amazing job. Your backyard looks incredible!!! I would love to come home and relax to that 🙂 Congrats! It is beautiful! Um, YEAH. Insane. I think Xio wants to have her 1st birthday party there 😉 Really great job Sarah & Lou!!! Each time I see pics of your house I get all whiny to Andres about wanting to own a home already. Wow, this looks fabulous! I’ve learned about “yardscaping” since moving to Austin, Texas, and it’s amazing how elegant it can look (not to mention easier to maintain!). I love me some Lowes too! I am the weird girl that has as much fun there as I do in the beauty section of department stores! HA! I cannot wait to see our plants in a year! It's going to be so beautiful! And di you notice a million new birds + butterflies when you planted? We have so many more hummingbirds and I love it! oh. my. gosh. sarah. this is AMAZING! 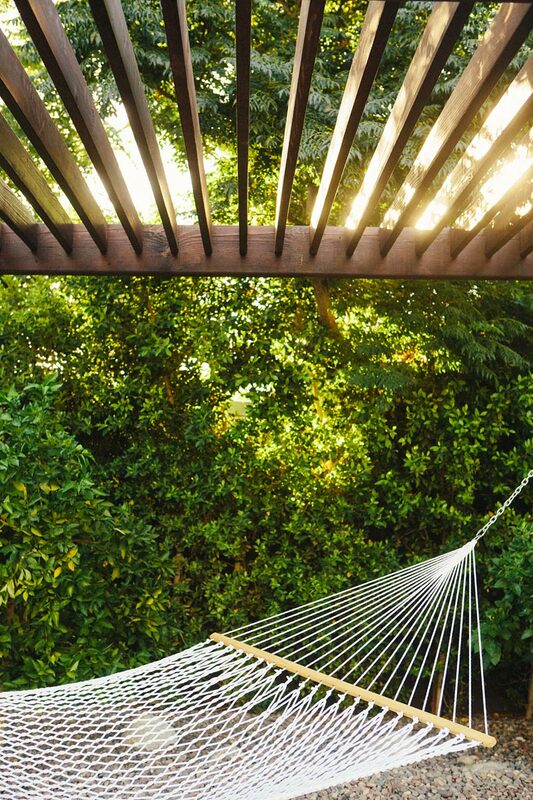 Yes, relax and have a vacation in your own backyard. 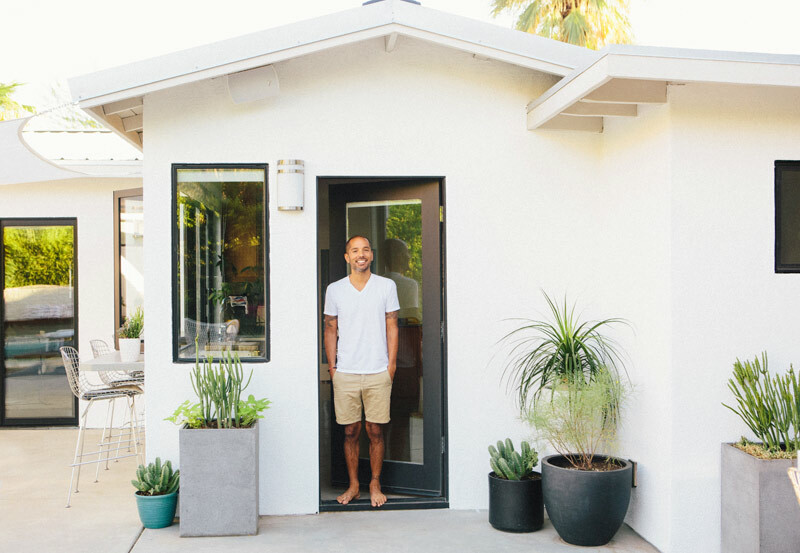 Kudos to you for taking on a xeriscaping project–I hope your amazing transformation encourages everyone to get rid of their grass…it requires so much of our precious resource, water! Thanks for sharing. Check out what Los Angeles Department of Water and Power is doing for LA residents on my post http://thefolia.com/2014/03/07/911-are-you-ready-for-the-big-one/ Happy Nesting. This is STUNNING!! Seriously you do live in a resort. Job well done! 🙂 I’m in love with your hammock. Thank you so much Lisa!! I wish I could have a pool party with everyone that stops by here, that would be so much fun! Beautiful!!! So, when can I come over??? LOL! The transformation is amazing! 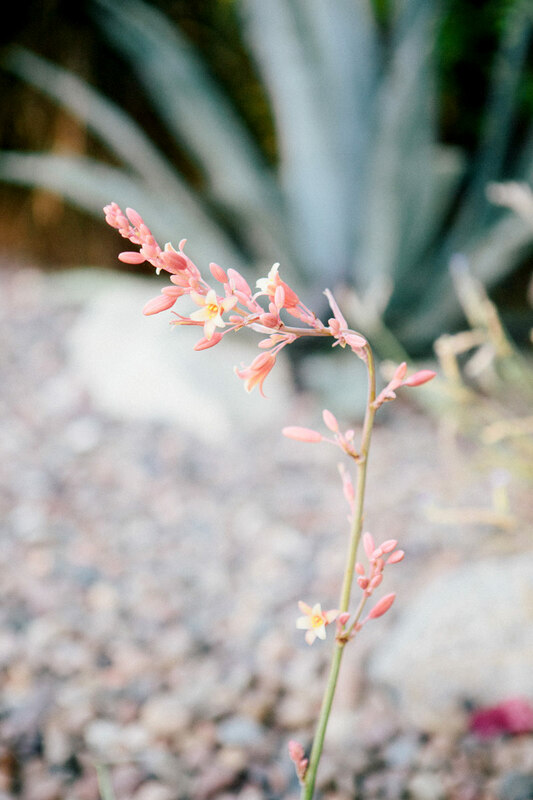 I absolutely love the idea of planting with drought resistant regional plants to keep things low-maintenance. I definitely think you should put a dining table under the hammock structure, it would be perfect for outdoor entertaining! I can’t wait to see all the plants grow in. Wow, this is absolutely beautiful! The landscape and pool. Just amazing. Good job! You guys, it turned out so beyond words good!! 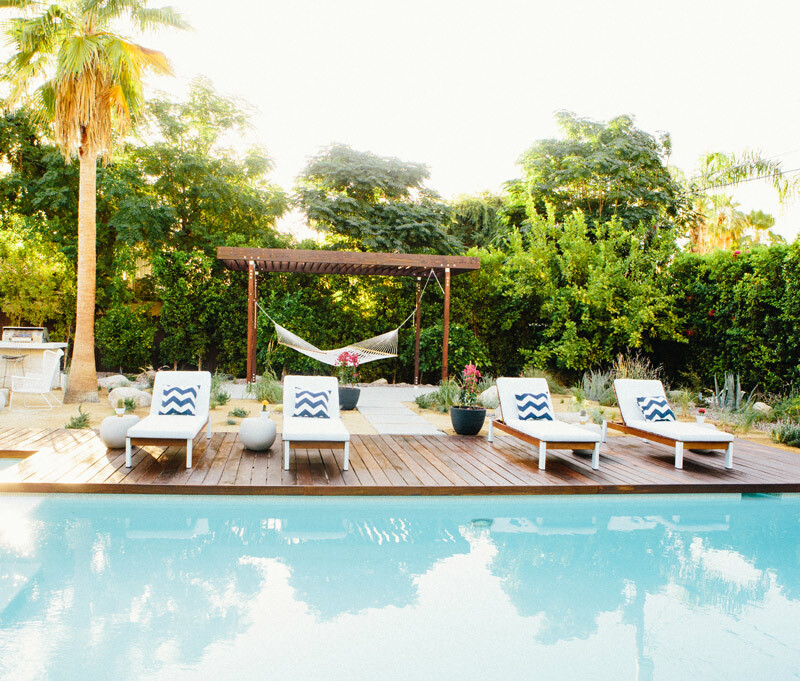 The Palm Springs desert is always the happy place I go to in my head…but now may I borrow your hammock to add to that scene? So serene and peaceful. 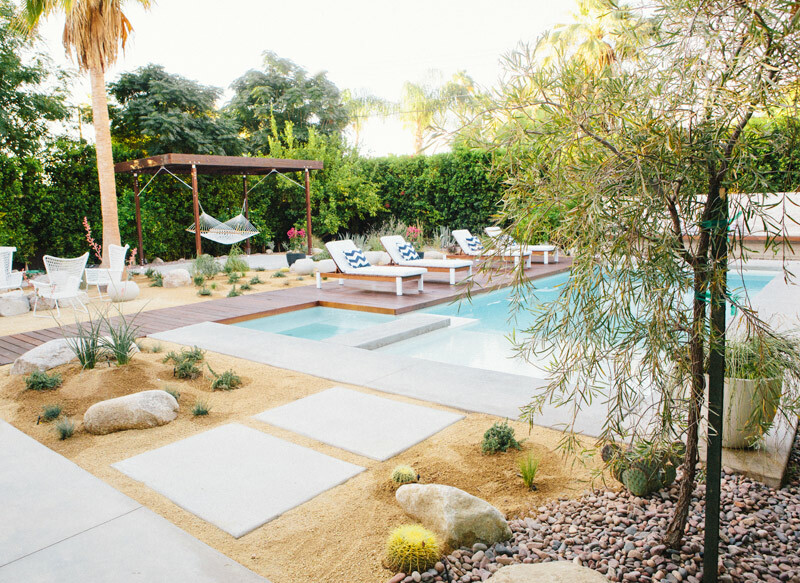 Love the succulents and the hammock! The ideal spot for unwinding and relaxing after a long day! Your house has always been an inspiration. My husband and I are trying to decide what color to paint our exterior and are having such a difficult time. What color did you end up repInting your house in? Great backyard! Which type of plant is used for the tall hedge around the fence? I love those but not able to find the correct name.